If you plan on traveling on Interstate 4 throughout the greater Orlando area, use the information provided to help you determine which exit best suits your needs. I-4 is considered an east/west interstate as it connects Tampa on Florida's west coast to Daytona Beach on Florida's east coast. In reality, this interstate travels just as much north/south as east/west. When traveling through most of Orange and Seminole counties, I-4 will be heading predominately north and south, though road signs will still use the east/west designation. Exits from both eastbound and westbound I-4 on to SR 436 in Altamonte Springs. This I-4 exit brings you right into the city of Altamonte Springs. When heading east on I-4, it is the first exit into Seminole County after leaving Orange County. It is one of the busiest I-4 exits in all of Seminole County. At this I-4 exit, you will find the greatest selection of dining and hotel accommodations east of the attractions. East or west you will find a large selection of gas stations, hotel rooms, fast food, shopping, and casual dining. Exits from both eastbound and westbound I-4 on to West Maitland Boulevard in Maitland. This I-4 exit brings you into the city of Maitland. Exits both eastbound and westbound. There are two exit ramps for both eastbound and westbound depending on which direction you want to head onto West Maitland Boulevard. This exit is mostly used for the Maitland Business Center. You will find little to no dining or shopping when you first exit here. It is approximately 2.5 miles to Forest City Road. This exit is approximately 2 miles to North Maitland Avenue. On Maitland Avenue, there is an abundance of independent medical offices and the Jewish Community Center and School. Exits from both eastbound and westbound I-4 on to Lee Road in Winter Park. This I-4 exit brings you right into the city of Winter Park. When heading east on I-4, it is the first exit out of the City of Orlando. You will find a large number of shops at this I-4 exit. This exit is useful if you want to reach Edgewater Drive (to the west) or US 17-92 (to the east). It is approximately 1.5 miles to Edgewater Drive. It is approximately 1.5 miles to US 17-92, just north of the Winter Park Village. Exits from both eastbound and westbound I-4 on to Fairbanks Avenue in Orlando. This I-4 exit brings you into the City of Orlando. This exit is mostly used for residential communities west of I-4 and small businesses east of I-4 on Fairbanks Avenue. It is approximately 2 miles to Edgewater Drive. It is approximately 2 miles to US 17-92. Exits from eastbound on to Par Street in Orlando. This I-4 exit brings you into the Orlando community of College Park. Exits only from the eastbound direction. The entrance ramp onto I-4 is only westbound. This exit is mostly used for the residential community of College Park. Exits from both eastbound and westbound I-4 on to Princeton Street in Orlando. It is approximately .5 mile to Edgewater Drive where you will find the heart of College Park's restaurant and shopping area. It is approximately .5 mile to Orange Avenue. It is approximately 1 mile to US 17-92. Exits from both eastbound and westbound I-4 on to Ivanhoe Boulevard in Orlando. 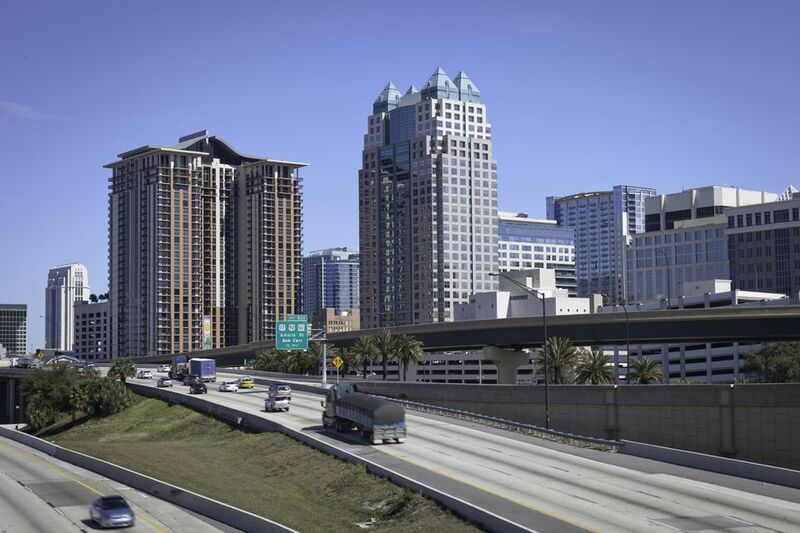 This I-4 exit brings you to the northern section of downtown Orlando and the southern portion of College Park. This I-4 exit is mainly used for commuters to the northern portion of downtown Orlando. With lakes on both sides of I-4 at this location, you will find that it is mostly for connections to North Orange Avenue and North Magnolia Avenue. This is a popular entrance on to I-4 eastbound since Colonial Drive does not have an eastbound I-4 entrance. Exits only westbound I-4 on to Colonial Drive in Orlando. This I-4 exit brings you into the northern part of downtown Orlando. Westbound entrance is available from westbound SR 50 (West Colonial Drive). Eastbound entrance is available from eastbound SR 50 (West Colonial Drive) at the Garland entrance. Eastbound entrance is available from North Garland Avenue, which is a one-way road. There is an abundance of shopping and dining options along SR 50, including Orlando Executive Airport and Orlando Fashion Square mall. It is approximately 1.5 miles to US 17-92. Exit for eastbound I-4 for Amelia Street and Colonial Drive in Orlando. This I-4 exit brings you into the downtown Orlando area. Exits from both eastbound and westbound I-4 on to South Orange Blossom Trail (SOBT) in Orlando. This I-4 exit brings you to the northern end of South Orange Blossom Trail. At this I-4 ​exit, you will find a large number of shopping and dining options. Service stations and fast food selections will be near the interstate. Exits from both eastbound and westbound I-4 on to John Young Parkway in Orlando. This I-4 exit brings you to John Young Parkway. This exit is mostly used to access other roads running through the Orlando area. There are a minimal amount of stores, restaurants, and service stations at this exit. A connection at Millenia Boulevard can bring you into The Mall at Millenia. Intersects the east end of Conroy Road and Americana Boulevard. Exits from both eastbound and westbound I-4 on to Conroy Road in Orlando. At this I-4 exit, you will find a large number of shopping and dining options. Intersects South Kirkman Road and South Hiawassee Road. This exit brings you to the Florida Turnpike. This exit is used for exiting to the Florida Turnpike. This I-4 exit brings you to the eastern end of International Drive. These are confusing exits, and it is best to pay close attention to road signs. Another important note is that when getting onto I-4 west from either Kirkman Road or Universal Boulevard, you will not be able to exit at either 74B or 74A. Exit 75A is for westbound I-4 and will take you to South Kirkman Road going in a southern direction. Exit 75B is for eastbound and westbound I-4 and will take you to South Kirkman Road going in a northern direction. To gain entrance to I-4 from South Kirkman Road when you are traveling in a southbound direction, you can only enter Westbound I-4. Please note that when you attempt to access I-4 at this spot, you will not be able to exit at either 74B or 74A. To gain entrance to I-4 from South Kirkman Road when you are traveling in a northbound direction, you can only enter eastbound I-4. At these I-4 exits, you will enter the northern end of International Drive with its mega shopping centers as well as an abundance of hotels and dining options. These exits can also be used for Universal Orlando theme parks and CityWalk. This I-4 exit brings you into Universal Orlando. Exits both eastbound and westbound. Entrance to I-4 both eastbound and westbound. This exit is mostly used entrance into the Universal theme ​parks. Take this exit if you are traveling eastbound on I-4 and wish to access South Kirkman going in a southbound direction. This I-4 exit brings you to SR 482, Sand Lake Road. This exit is host to some of Orlando's best dining. Nowhere in the central Florida area will you find more dining options in such close proximity. This I-4 exit brings you to the western end of Toll Road 528, Bee Line Expressway. Use this exit for SeaWorld Orlando and the ​Orange County Convention Center. This I-4 exit brings you to Central Florida Parkway. This I-4 exit brings you into the Buena Vista area of Disney in Orange County. You exit onto SR 535, which heads in a more north-south direction. This is a popular exit for shopping and dining. When using this exit, allow for extra time as it is generally rather congested. This exit will bring you into the downtown Disney area to the north and hotels and shopping to the south.